I think I’ve mentioned before that my heritage is half Italian. My mother’s father was born in Italy, although his family migrated when he was two. My maternal grandmother was born in New York but she and her younger sister were the only siblings of the nine in the family that were born in the US. My grandparents (and all the kids) moved to the west coast during World War II, first to Vancouver, Washington to work in the shipyards, eventually making their way to Salem, Oregon where they lived out the remainder of the 94 years that they both achieved. Some of my earliest memories are of the Italian Plum trees in the backyard of the house where they lived. At the very back of the yard two large trees flanked a pathway that led from the house to a gate that led out to the alley. There were so many plums on those trees that there were plenty for my grandparents, our family and my mom’s sister’s and two brothers’ families. We generally met about this time of year for a massive picking party. The yard would be littered with those that had ripened early and dropped from the trees. Ladders and buckets and bushel boxes would be evident everywhere you looked. The uncles and older cousins would be up on ladders picking the highest fruit, while the younger ones would be assigned whatever they could reach from the ground or they’d be running full buckets from those on the ladders to the bushel boxes. Often the aunts would be inside making jam with the first bucketfuls to come from the tree. And at some point during the day there’d be lots of food – maybe big pots of spaghetti or a picnic lunch to which everyone had contributed. There was always food. By the time we were done each family would have several bushels to take home to can or make into jelly and my grandparents would have stacks of filled jam jars ready to be stored and used over the winter. 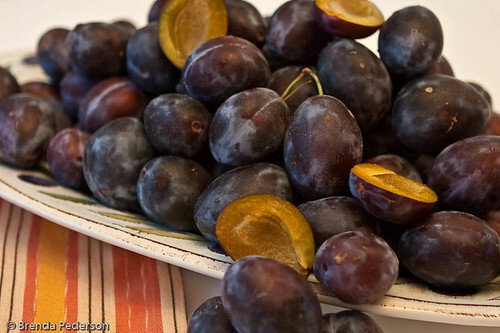 Italian plums always bring back memories of those fun family occasions. So today while I was at a friend’s house to help her pick her Italian plums my mind kept wandering back to those warm summer days filled with family and food. My friend most generously gifted me with as many plums as I wanted and I ended up with about twenty five pounds of fruit! The first several pounds have simply been washed, allowed to dry a bit and then split and the pits removed. I placed the plum halves on silicone lined baking sheets and they are now in the freezer being individually frozen. Once frozen I’ll package them in Ziplocs. Freezing them on the sheets will keep them as individual pieces so I’ll be able to pull out as many halves as I need in the future. Many of those will go into tagines or other braised meat dishes. I also plan on making a few batches of jam and am still pondering what I’ll do with the balance. However, I’m pretty sure there’s a clafouti somewhere in my future and perhaps some sort of plum ice-cream or sorbet… so many options. But for now, it’s time to remove the plums from the freezer and package them up!